Definition at line 47 of file llsys.h. 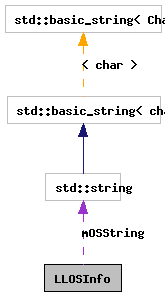 Definition at line 67 of file llsys.cpp. References MAX_STRING, mBuild, mMajorVer, mMinorVer, mOSString, NULL, and utf16str_to_utf8str(). Definition at line 217 of file llsys.cpp. References llendl, llerrs, and S32. Definition at line 253 of file llsys.cpp. Definition at line 304 of file llsys.cpp. References LLFile::fopen(), LL_MAX_PATH, llendl, llwarns, NULL, S32, and STATUS_SIZE. Definition at line 261 of file llsys.cpp. References LLFile::fopen(), LL_MAX_PATH, llendl, llwarns, S32, and STATUS_SIZE. Definition at line 248 of file llsys.cpp. Definition at line 57 of file llsys.h. Definition at line 55 of file llsys.h. Definition at line 56 of file llsys.h. Definition at line 66 of file llsys.h. Referenced by getOSString(), LLOSInfo(), and stream().